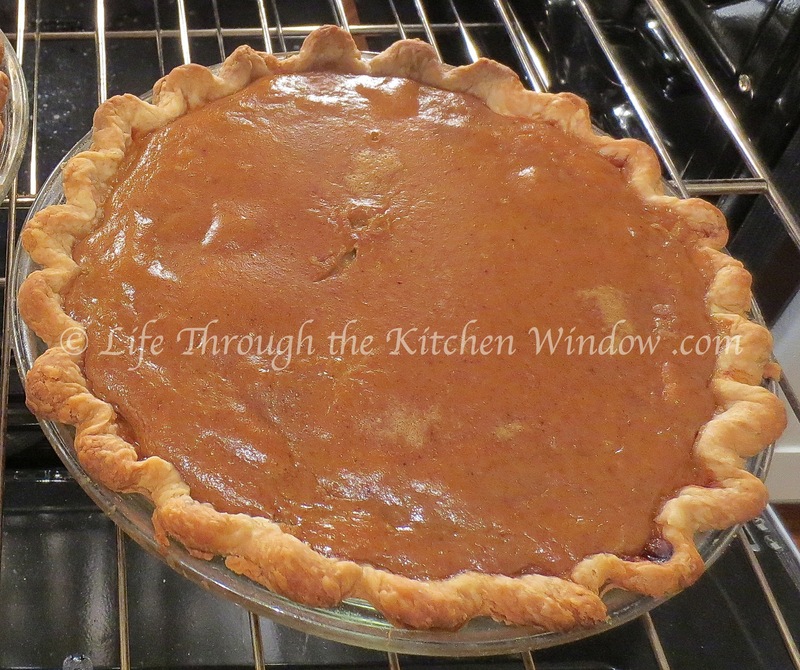 So, how is it that I’ve never posted a recipe for pumpkin pie? I’ve certainly talked about it often enough over the course of 250+ posts. After all, everyone in my family loves it, and that’s saying something given the range of tastes among the bunch of us. I’ve talked about making pumpkin pie, pumpkin pie ice cream and how to make your own pumpkin puree, but it’s finally time to share the recipe for my pumpkin pie filling. I like to use my own homemade pumpkin puree when I have it on hand. 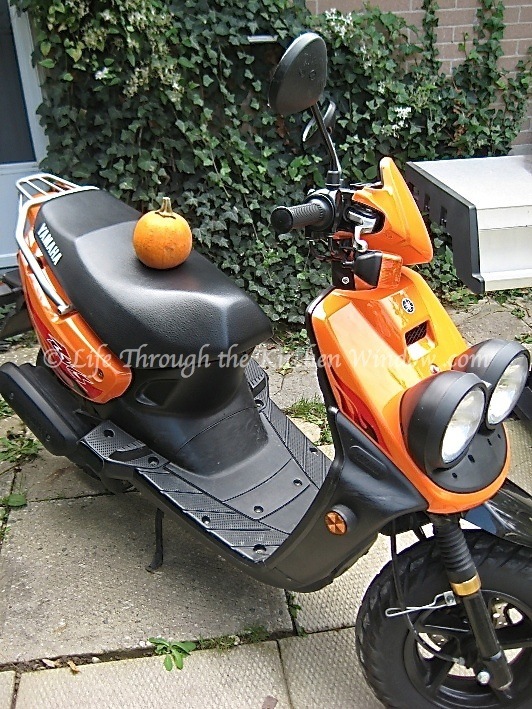 But let’s be realistic: if you don’t happen to have puree handy in your freezer, you’re not necessarily going to start your pie by hopping on your scooter and charging off to buy a pumpkin. Sweet and adorable as pie pumpkins are, sometimes a can of plain pumpkin puree can be your best friend. Note that I said plain pumpkin puree and not a can of pumpkin pie filling. Why? Well, who’s in charge of the flavour of your pie, you or some unknown processing plant that doesn’t know how much cinnamon and other spices you like? Right, I thought so. As a general rule, keep your processed ingredients as natural and pure as possible, giving you the most control over the flavour of your recipes. I do find that there’s a difference in texture between canned pumpkin puree and what I make and freeze for myself. Generally, I’d say that my homemade puree is more liquid. Perhaps the type of pumpkins used is a factor, or something in the processing. Regardless, in my opinion both make a fine pumpkin pie. The recipe that I’m presenting to you today makes a soft, almost silky pumpkin custard. I was a little concerned that it wouldn’t set up properly, but it did just fine. Some recipes call for evaporated milk or cream, but I find that regular two percent milk works just fine. I’ve seen recipes on the internet that use dairy alternatives such as almond milk, but haven’t tried any of these. If you have, please leave a comment to let me know how your pie turned out. As always, this year’s pumpkin pie was a crowd pleaser, even though it was in competition with my apple crostata and a cherry pie that my Mom contributed. These are among the most attractive pies I’ve made; I was especially pleased with how the fluted edges turned out. We ate almost a whole pumpkin pie at dessert, and my daughter took the second pie as her contribution to a Thanksgiving dinner she was going to the next day. She tells me she gave me the credit when people asked, “Is it homemade?” Thanks, Jenn! The spicing of a pumpkin pie is crucial to its outcome, in my ever-so-humble opinion. I like my pies to be flavour-forward, but not aggressively spiced. The blend of cinnamon (even better now that I’ve discovered Saigon cinnamon), ginger, nutmeg and cloves presented here is what says “Mum’s pumpkin pie” to my family. This recipe makes enough filling for two 9-inch pies. I used the same pastry as for my apple crostata, with slight modification (regular granulated sugar and no cinnamon). I’ll write about pastry another time, as that’s a topic unto itself. Suffice it to say that I’ve switched from using vegetable shortening in my pastry to unsalted butter and I’m not going back. Preheat the oven to 425ºF. Prepare two 9-inch unbaked pastry shells. Lightly beat the eggs in a large bowl with a whisk. Add the pumpkin puree, sugar, salt and spices and whisk to incorporate. Using the whisk or a spoon, stir in the milk (don’t whisk it in; the idea is to blend the milk with the other ingredients but not to incorporate air). 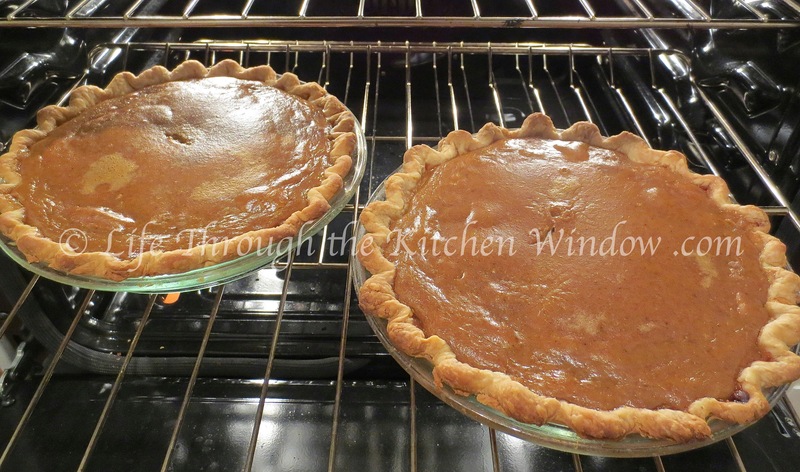 Carefully pour or ladle the pumpkin filling into the two prepared pie shells, filling them evenly. Gingerly transfer the filled pies to the heated oven. Bake for 15 minutes at 425ºF, then lower the heat to 350ºF and continue baking for another 45 minutes, or until a knife inserted into the centre of the custard comes out clean. Cool the pies on racks. Once completely cooled, wrap in plastic wrap and refrigerate until ready to serve. Slice and dollop on a pillow of whipped cream or serve à la mode; either way, expect requests for seconds. I so agree with you, Mar, on the question of puree versus pie filling. 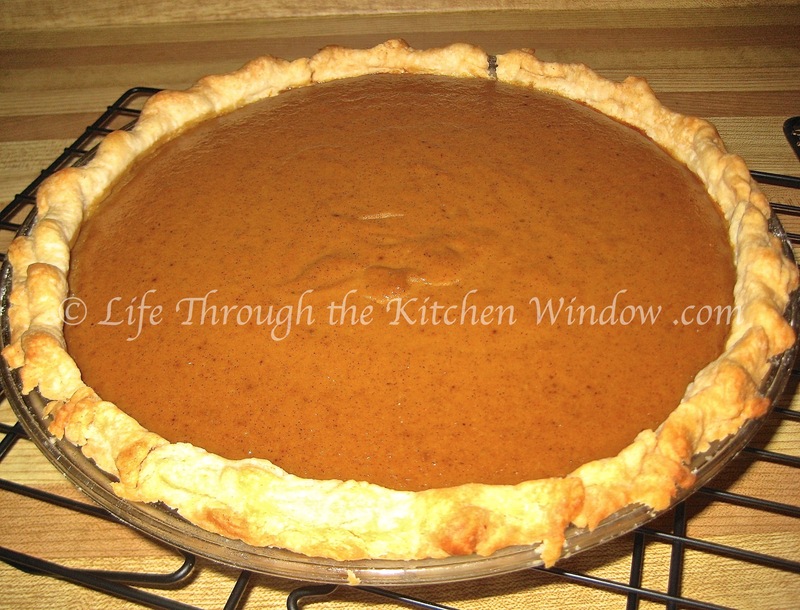 I’ve tasted some delicious pies but one made with pumpkin puree always tastes better. And I’m sure your pies taste better still. That’s a great list of spices that you’ve used. On occasion I’ve bought the pie filling by mistake, and I’ve always found I needed to add more spice to it. It makes me feel a little sad to think of people just using it as is without kicking up the flavour. Anyway, the closer to scratch cooking we can get, the better! Not to mention, the more we can tailor our food to exactly what we like. Love this post Mar…that pie makes me drool!!! Great scooter shot! Thank you, Sherri! Actually, over the years I’ve probably made more pumpkin pie with canned puree than with puree I’ve made from scratch. 😊 As long as you’re starting with plain puree, it makes a delicious pumpkin pie. To me, the secret is in the spicing, coming up with the blend that becomes your signature pumpkin spice. Given the choice, I will use my own puree, but I don’t always have a supply on hand and you can’t always find a pie pumpkin. That must be the secret, the spice! I had to try and find the difference with spices, as here we have ‘Mixed Spice’ but in the States it’s called ‘Allspice’ but they are slightly different in taste, Allspice having more cinnamon in it I think. Our Mixed Spice is more nutmeggy (if that is even a word!) and I would be more likely to use that in something like hot cross buns. The taste and texture of pumpkin pie was so different to me when I first tried it and some of my British relatives to this day don’t like it, but then again, I just could not get my American relatives to take to our Christmas pudding!!! Allspice as I know it is a single spice, and not a blend http://en.wikipedia.org/wiki/Allspice) but it doesn’t surprise me that someone has created a blend that they call Allspice. For the most part, I like to make my own spice blends so I can get just the right balance of the individual components (“right” being defined by my own taste, of course 😊). I also find that terms mean different things in different versions of English, so it’s always good to do a little research when using a British, Australian or US recipe, rather than just assuming I know what they’re talking about! I think pumpkin pie is one of those things that people feel strongly about, one way or the other. You love it, or you don’t! I still remember the first time I had an English-style Christmas pudding. I was expecting custard but of course got a mixture of dried fruits and probably suet, and it was more than my teenaged taste buds could handle! I would love to shop at a store called The Silken Road … just sounds like it would be full of so much exotic and fragrant wares. And my daughter’s always helping me out, so I was pleased to give her a pie!